Passion, spirituality and harmony ignite BOJAC: The Best of Jewish A Cappella, a collection of today's hottest young Jewish vocal acts. These exciting male, female and co-ed groups fire up every style of Jewish music, from religious melodies to Israeli pop, in English and Hebrew. 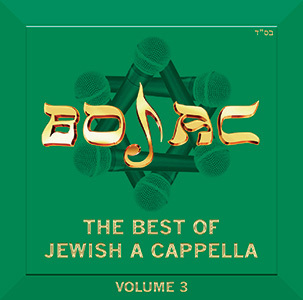 BOJAC: Volume 3 is 18 tracks of pure Jewish music adrenaline! BOJAC is available from Sameach Music. Click here to order! For clips from all 18 amazing tracks, check out episode 29 of The KolCast -- press play below to listen! Check out BOJAC Volumes 1 through 3!